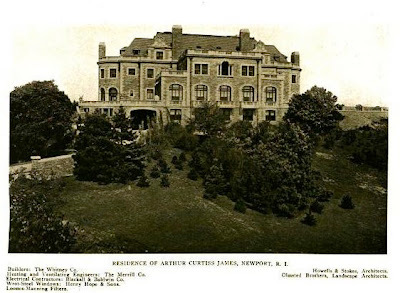 'Beacon Hill House', the Arthur Curtiss James estate designed by Howells & Stokes c. 1909 in Newport, Rhode Island, with landscaping by the Olmsted Brothers. 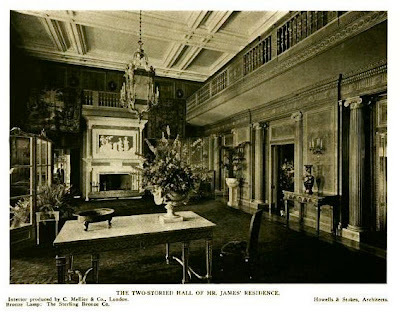 James, a railroad tycoon, intended to remodel a c. 1890s Stanford White designed house on the site but built 'Beacon Hill House' after discovering structural defects within the foundation of the original home. 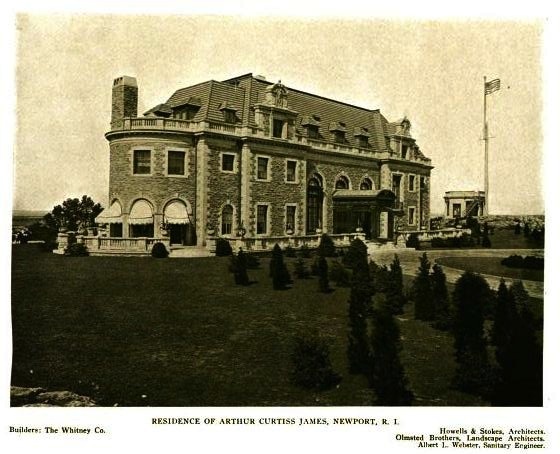 The estate included a farm complex designed by Grosvenor Atterbury c. 1916. James and his wife died in 1941, the contents of the house were auctioned in 1944 and the residence sat empty while vandals and finally a fire destroyed the house in 1967. 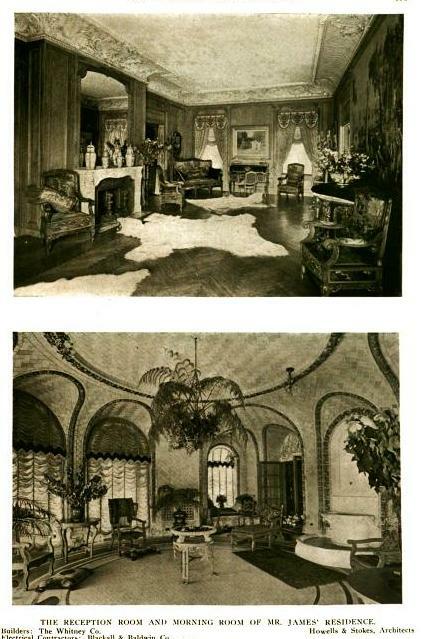 Photos from Architecture and Building, 1913. When I first saw Newport, forty-odd years ago, this place had just departed the scene, and the grounds and outbuildings hadn't yet all been subsumed by development and alteration (there are a couple of really hideous McMansions on the actual house site). The garage itself was palatial and gorgeous. While I certainly can't accuse this house of being beautiful, it's undeniably splendid and interesting (and far better than poor Mr. CPHG would have done). Architecturally, it looks as if one could catch the 9:45 to Chicago there. The detailing is lush. 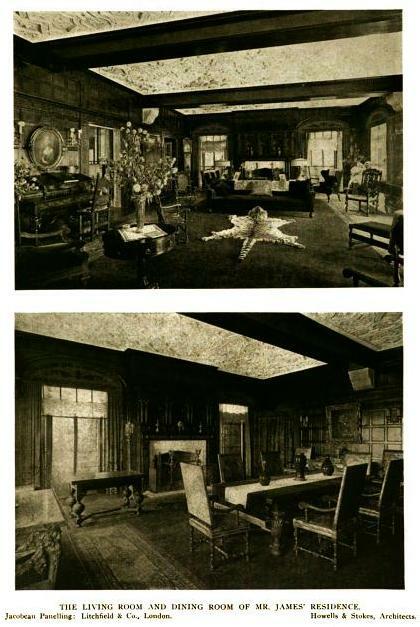 The James's town house, likewise, was an extremely odd duck. As for that farm, which like other portions of the estate belong to Hope Hamilton, an heiress to Campbell's Soup, who supports a foundation for high-tech heritage breeding behind the quaint walls. I've been intending a post about the farm forever, but not for nothing do they call me a dilettante and I've never gotten around to it. May I ask how many vandals actually reside in these small communities? 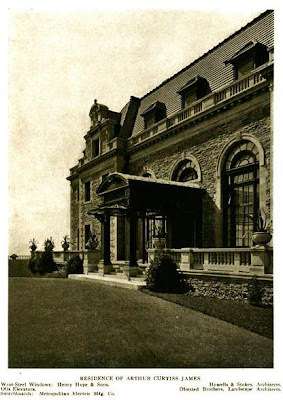 Newport is not Brooklyn or Manhattan, I also find it very hard to believe when I read stories about Long Island mansions...vandals destroyed...in towns like Lattingtown, Brookville and Old Westbury. These places are small and have no real "town" to speak of....so where do all these vandals come from? In Newport, one of the biggest vandals for years was a local developer who seemed to take pleasure in giving the old summer colony the finger, buying estates at the bottom of the market, and turning them to multi-family housing in the harshest way possible. There also is the "really lucky" vandal. Properties purchased by developers who are in legal limbo with towns and are in heated battle with local zoning regulations or preservationists. They usually have the uncanny "luck" to have purchased an old house which miraculously self combusts one dark lonely night into a huge inferno. Vandals are always blamed. Problems then go away! The number of times this has happened is disturbing. The John Sargeant Cram estate in Old Westbury and Pickett Farm come to mind. Then there are the developers who promise preservation then have a change of heart allowing unrestricted vandalism and "demolition by neglect" to doom their properties, alla Burrwood in Lloyd Harbor and Lands End in Sands Point. Dont know which owners are the least evolved form of pond scum, but both are cowardly. The ones that came to my mind were the ones I suppose I was most familiar with...drunken teenagers with nothing to do deciding to take themselves on a little tour and if some stuff got broken...oh well. For some reason I think of Charles Bronson's 'Death Wish'...where one of the hoodlums who break into his apartment has a can of spray paint and is spraying everything simply for the sake of spraying it. No art, no design, no purpose...just a line of hot pink spray paint running along every wall. I would add local towns and villages and counties as well that prefer demolition to preservation. Long Island's Nassau and Suffolk County are notorious for neglecting the properties that are publicly owned or acquired. Old Westbury and Mill Neck turn down landmarking time and time again. And in a sense we are all contributing vandals, preferring apathy and shrugging our shoulders when so much is lost due to just one person's short-sighted decision. 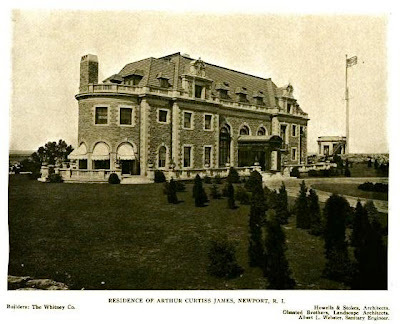 i.e, The Eberstadt mansion torn down in Lloyd Harbor, then the wildlife refuge asks for funds to build a new visitor center. Even the Muttontown Preseve has looked into constructing stables, barns and storage facilites to house their equestrain center, this all proposed on the exact same site of the Knollwood farm complex. Foolish short sighted demolition occurs just as often as mindless vandalism. I didn't mean anything negative about Brooklyn or Manhattan. I meant that they are much, much larger than Old Westbury or Newport, and drunken vandals sneeking into a property to cause damage was easier to get away with in places so large, noisy and active. A loud window smashing in the city would go un-noticed compared to a shattering glass in Upper Brookville or Mill Neck. Of course one of the greatest parts of the problem is how really difficult it is to find new owners for these houses. Hence, they go unoccupied, etc. Anon, a huge problem with landmarking and preservation in small villages, outside of areas like Newport and Charleston, etc, where strong preservation organizations are present, is inevitably money. As in the case of Glen Cove a few years back. They knew of Winfield Halls owner's complete lack of maintenance on the building yet their hands were tied and it showed how totally inaffective landmarking is. They didnt want to accuse anyone of "demolition by neglect" and be sued, they could not afford legal representation to bring the matter to court and they thought just because the property had landmark protection status, the owner could never ever demolish it, which of course is untrue. Landmarking is only one step. You need a concerned population that cares about its heritage and history. Many villages take a "live and let live" policy electing to stay out of their sometimes very powerful residents way and not interfere in their business, even if it means they lose the very essence of what makes their villages so unique. While Knole was supposedly sold, as far as I know, it sits empty awaiting an uncertain future. The property looks unused. Legal landmarking as we have it in NYC will likely never be possible in places like the North Shore. NYC's landmark law is predicated on previous court findings that the facades of buildings are more or less part of the public as they face public streets which are accessible and therefore enjoyed by everyone. Unlike a place like Mill Neck, where a house set back on 4 acres cannot be seen by anyone but the owner (obviously case specific for this example). And private property rights in that regard would trump landmarking (because you know if you can afford a 4 acre house in Mill Neck you can afford to go to court). It'd be extremely hard to tell people what to do with their house when it sits on property no one can see and thus not enjoy. None of this is to be confused with a conscientious owner placing a covenant on said property (like Groton Place in OW). Regarding Knole, I think I've mentioned this before but this particular case is fairly rare. A developer purchased the estate with intentions of developing the entire property, including demolishing the house. OW granted permission for subdivision but refused to grant a permit to demolish the house. I don't know their reasoning behind this but you could be sure there would have been quite an outcry. They ultimately forced the developer to sell off the main house lot to anyone...and it was eventually purchased by some tax exempt religious organization. Unlike Spring Hill...where the Village told the developer he had to demolish all of the extant outbuildings. This included the gate house, the garage, the barns and the large stables/greenhouse complex (which is original to the 1903 design). Thankfully, the developer fought the Village over this and was successful (minus the garage which was in very bad shape anyway). And a family went on to buy the entire stables lot. For a while it seemed like Old Westbury was hell bent on scrubbing away every last thing that made it Old Westbury. But at least we still have Knole (well...someone does). Note: The carved marble fountain in the oval sun room at "Beacon Hill House" was bought by the Tinney family at Belcourt Castle and then sold to Ardvark Antiques in Newport RI for a while - I took a lot of photographs of it while there. 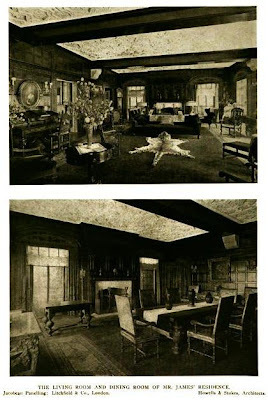 I just saw that it bwas the reception room there. In the photo it is on the right.